This MAb recognizes a protein of 130 kDa, identified as Ksp-cadherin. This MAb recognizes a protein of 130 kDa, identified as Ksp-cadherin. Cadherins form a superfamily of related glycoproteins that mediate calcium-dependent cell adhesion and transmit signals from the extracellular matrix to the cytoplasm. Cadherins have been implicated in embryogenesis, tissue morphogenesis, tissue structure maintenance, cell polarization, neoplastic invasiveness and metastasis, and membrane transport. It is suggested that Ksp-cadherin is a marker for terminal differentiation of the basolateral membranes of renal tubular epithelial cells. Within the kidney, Ksp-Cadherin is found exclusively in the basolateral membrane of renal tubular epithelial cells and collecting duct cells, and not in glomeruli, renal interstitial cells, or blood vessels. 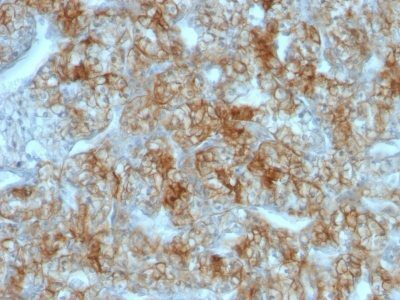 Ksp-Cadherin has been suggested to distinguish Chromophobe Renal-Cell Carcinoma from Oncocytoma. 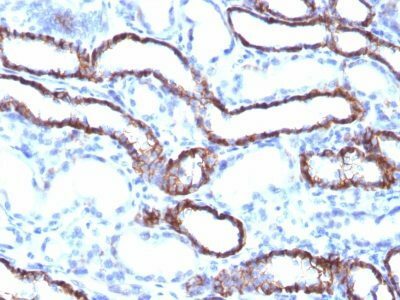 Catalog number key for antibody number 1071, Anti-CDH16 (CDH16/1071) The prefix indicates conjugation, followed by the antibody number and size suffix.